Save time and kitchen mess by cooking all of your ingredients in one pot. All you need to prepare these no-fuss family dinners is one pot and your ingredients. 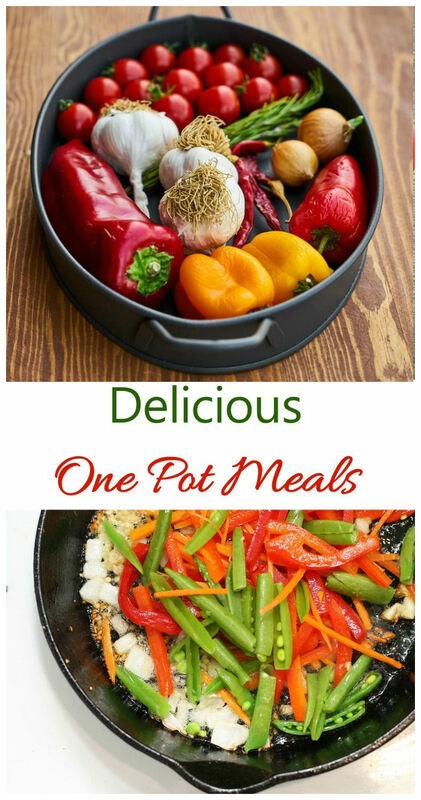 These one pot meals are easy to prepare, great tasting and insure that there will be very little clean up when you are done cooking. Try one pan cooking and discover just how easy and tasty this type of cooking can be. For me, cooking meals in one pot is a very relaxing style of preparing food. I love the flavors that come from layering ingredients as the cooking progresses. I find that, not only is the final clean up a breeze, but that I clean up as I go the ingredients and utensils during the short cooking periods. Instead of tending several pans on my stove and making mistakes, my meals are goof-proof with only one pot to watch. What is one pan cooking? To be considered a real one pan meal, it means that everything is prepared in one cooking vessel. Most of us have many slow cooker recipes on hand. They are the original one pot cooking utensil. However, even though crock pot recipes are made in one pan, I don’t consider them one pot meals. The reason is that truly great tasting one pot meals are developed using layers of flavor. For many recipes, that means some vegetables are cooked in oil for a while and then meat is added. When that develops flavor, then sauces are added. The final step is to add rice or fresh herbs or other seasonings that take less time to cook. The end result is a fabulously tasty meal because each cooking step adds flavor to the one that came before. That is quite different from putting everything in a crock pot, turning it on and going away for a while as it cooks. Not only will the flavors be quite different because of the cooking process but the COLOR of the meal will be miles apart. 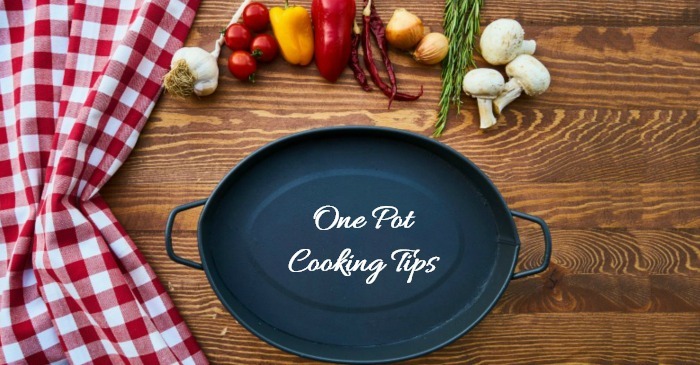 Be sure to check out my tips for one pot cooking to get great results for your one pan recipes. What types of meals are best for one pot cooking? I particularly enjoy making soups, skillets and stews in one pan. Some casseroles also can be prepared this way, if they are cooked in dishes that will take the heat of both the stove top and the oven AND if the meal is complete in the one dish. Try these one pot meals for recipes that your family will love. I’ve put together a collection of my favorite one pot meals for you to try. Most are fairly easy to prepare and all of them taste fabulous. Why not try one today? Soups are the ideal recipes for cooking in one pot. Just start with your oil and a few veggies and then layer on the flavor until you have a delicious bowl of soup. Try one of these soup recipes. Bacon Corn and Shrimp with fresh thyme gives this delicious one pot shrimp chowder a wonderful flavor. this Chicken pot pie soup gives you a home cooked, nostalic meal that reminds you of mom’s cooking. Thai chicken and Coconut Soup – This spicy soup is also known as Tom Kha Gai in Thai restaurants. This Delicious Potato Cheddar Soup with Bacon is on the table in just 20 minutes. What could be easier? This amazing Lasagna Soup Recipe is ready in less than a hour and tastes just like the traditional lasagna casserole. There is nothing quite like the taste of a stew that has simmered on the stove top getting more and more flavorful as the cooking time progresses. My favorite way of cooking a stew is using a Dutch oven with deep sides and long slow cooking on the stove. Perhaps one of these stew recipes will be on your table tonight! Make a batch of this one pot chicken barley stew to warm up in the winter months. This one Pot Spicy Chicken Stew uses white wine and a blend of spices for one delectable flavor. 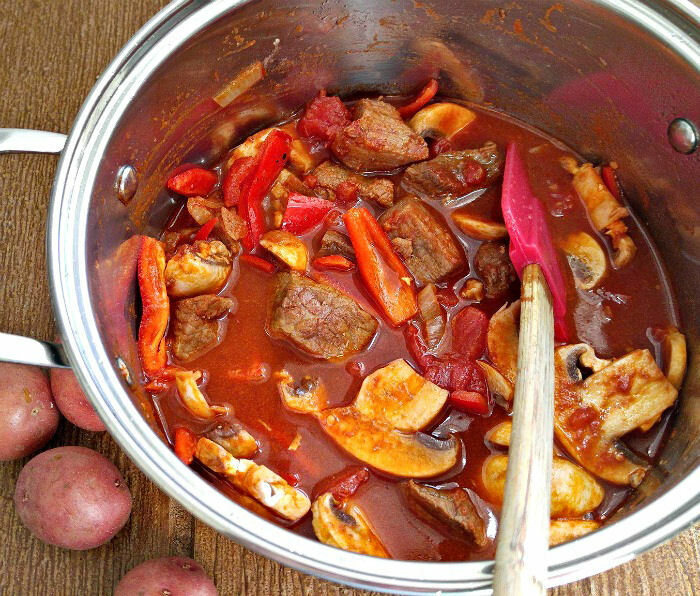 For a tasty Whole30 stew, try this easy beef goulash. It uses red bell peppers, mushrooms and onions in a savory and rich tomato paprika sauce. Skillet recipes are probably the most often type of recipe that one thinks of when we say “one pot cooking.” They are quick to prepare and taste delicious, too. These skillet recipes are sure to be the hit of your family. Get a taste of New Orleans with this one pot jambalaya. It combines chicken, shrimp and sausages with rice and spices for a delightful Cajun meal. Big tender chunks of spicy beef make this one pot chili con carne the perfect choice for a cold winter’s night. Do you love the flavor of chicken and Parmesan cheese? Try this creamy chicken and mushrooms recipe with a delicious garlic cream sauce. For an Asian stir fry that will rival your favorite take out, try this Teriyaki chicken with vegetables recipe. Got 15 minutes? Try this Beef Broccoli and Couscous Stir Fry. It uses Middle Eastern Couscous for a delicious texture. If you love Helper Style meals, give this Beef and Penne Pasta Recipe a try. It has a rich tomato red wine sauce that gives it loads of flavor. Looking for a 30 minute meal with a fabulous sauce? Try this chicken piccata with artichoke hearts recipe. It tastes amazing! This one pot sausage rotini recipe is just full of flavor that is rich and hearty with the taste of fresh vegetables. The taste is to die for! Try this creamy garlic mushroom chicken recipe for an amazing Italian taste that your family will just love. When you have a yen for comfort food, give this broccoli chicken cheese and rice skillet. It’s ready in 20 minutes! Did you know that you can make a whole meal using a cookie sheet? Just line it with some parchment paper or a silicone baking mat to make clean up even easier. A sheet pan makes a great vessel for recipes that call for larger pieces of meat and veggies cooked right beside them. This balsamic chicken and vegetables meal is ready in just 30 minutes and tastes amazing. 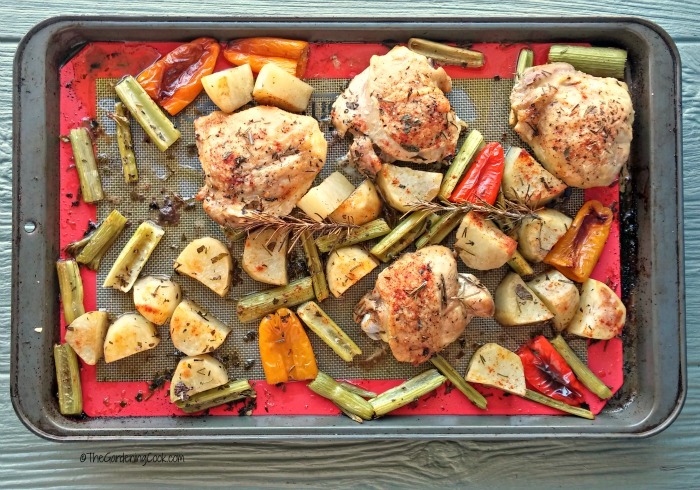 Try this one pan roasted chicken dinner for the easiest meal out there. Perfect for a busy weeknight, this sheet pan Garlic Parmesan Chicken will become a family favorite. 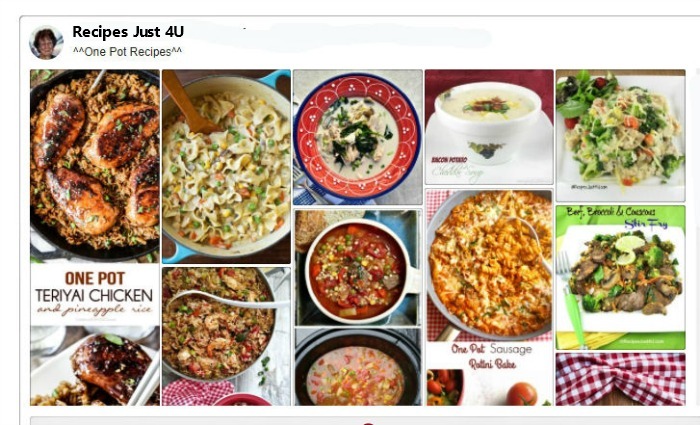 If you love one pot recipes, be sure to check out my Pinterest One Pot Cooking Board. It has loads of recipes to give you some inspiration. Try one of these Cheesecake Recipes that will tempt your sweet tooth. These 30 Minute Meals will be on the table in a hurry. Breakfast Recipes to start your day on the right foot. If you would like your one pot recipes to be a success, you need to start with the right cooking pans and pots. 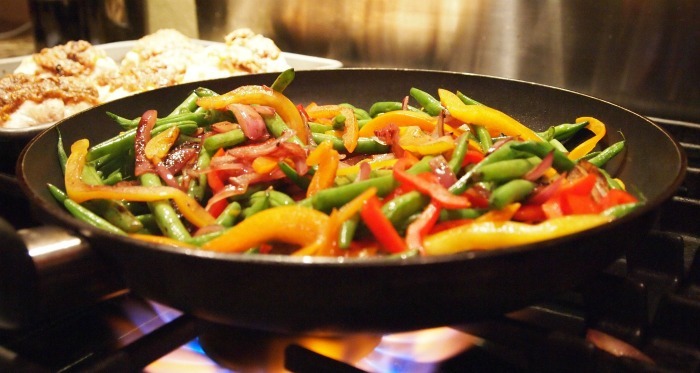 Choose flat bottomed pans for best success on the stove top (I use stainless steel.) For deep Dutch ovens, you’ll need long handled tools. Non stick finishes for baking sheets helps even more with clean up, as do parchment paper and silicone baking mats. And good quality casserole dishes that will go from stove top to oven are a must as well.